Peter Sasdy | No Chic. Just Geek. And now for a little unfinished business. As frequent visitors may have noticed, I spent a few weeks earlier this year watching and writing about the BBC TV show Doomwatch, which ran on BBC1 from 1970 to 1972. It has never been repeated, despite its enormous success and popularity at the time, and received only a very limited VHS release in the 1990s. As someone interested in TV science fiction and fantasy, though, I was always vaguely aware of the Doomwatch name, enough to make a point of taping and watching the movie based on the show when it turned up on TV – I’m not sure when this actually happened, at some time in the late 1980s I suppose – the main UK commercial network had just gone 24-hour, turning the wee small hours of the night into a treasure trove of obscure genre movies rolled out just to fill holes in the schedule. (What bliss it was, etc.) In any case, the big-screen version of Doomwatch was my first point of contact with the series. Peter Sasdy’s film was released in March 1972, during the gap between the second and third series of the TV show – it features the second-series line-up of characters (Ridge is still a member of Doomwatch at this point, as is Chantry), although features is the operative word – the main actors of the TV show are billed as ‘also starring’, with the lead roles taken by Ian Bannen (a very capable character actor) and Judy Geeson (a quietly prolific actress whose most memorable big-screen role was perhaps her gob-smacking appearance in Inseminoid). 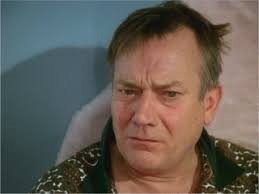 Bannen plays Dr Del Shaw, a member of Doomwatch’s big-screen-only division, who at the start of the film is packed off by Quist to the remote island of Balfe. The exact location of Balfe is left obscure, but, as we shall see, the temptation to assume it is somewhere off the Scottish coast becomes almost irresistible given how the film plays out. There has been an oil-tanker spill in the region and Doomwatch is checking out what effect this has had on the local ecology (the opening credits indicate that Doomwatch exists mainly as an anti-pollution agency, which is a bit of a simplification of the rationale given on TV, but I suppose it would work to bring new audiences up to speed). Arriving on Balfe, Shaw sets about obtaining his biological samples, but soon comes to suspect that not all is well on the island – most outsiders are unwelcome and resented, almost violently (although, for plot reasons, this does not extend to their schoolteacher, who is played by Geeson). Shaw finds himself shadowed by a gun-toting islander throughout his sample-collecting excursions. Many of the islanders have a short fuse, to say the least, if not an actual tendency towards savage brutality. Shaw comes across a body in a shallow grave, but when he returns it has mysteriously vanished. What is going on on Balfe, and has it got anything to do with the oil spill he has been sent to investigate? Peter Sasdy is probably best known as a director of genre and especially horror films – he did a couple of rather good movies for Hammer, Taste the Blood of Dracula and Countess Dracula – although his career effectively ended when he won a Razzie for a more conventional drama, The Lonely Lady. 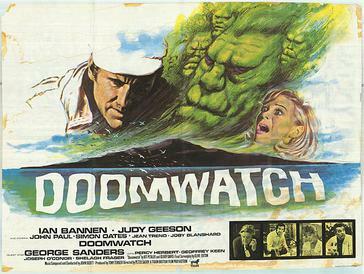 In a similar vein, the big-screen Doomwatch was made by Tigon, a production company best-known these days for making two classic folk-horror films, Witchfinder General and Blood on Satan’s Claw. So perhaps it’s not entirely surprising that, in some ways, Doomwatch’s big-screen incarnation feels like more of a horror movie than the TV version usually did (the US title of this movie was Island of the Ghouls, which is punchy if not especially accurate). What is perhaps a bit unexpected is the way in which Doomwatch anticipates or mirrors another classic folk-horror film. Look at it this way – an outsider arrives on a remote island, intent on investigating. The locals clearly have a secret which they are very reluctant to share with him. The local schoolteacher provides some intriguing clues. The body of a child disappears in mysterious circumstances. Now, all this happens in the early part of the film, and it’s not as if Ian Bannen is seized by the locals in order to be sacrificed as a way of lifting the curse on the community, but there is a sense in which Doomwatch feels like a weird pre-echo of many elements of The Wicker Man (I should mention that this film was released six months before The Wicker Man went into production, not that I’ve ever seen any suggestion it was an influence on Robin Hardy or Anthony Shaffer). And you could equally well argue that the premise of the movie – something in the sea near a remote coastal community is causing deformities which lead to many members of the community being hidden from outsiders – has something of the atmosphere and tone of H.P. Lovecraft’s The Shadow Over Innsmouth. Sasdy conjures up a reasonably effective atmosphere of mystery and menace during this opening movement of the film, culminating in an attack on Shaw by one of the island’s more brutish and deformed inhabitants. However, at this point the story turns into a science-procedural thriller of a kind which would be quite familiar to viewers of the Doomwatch TV show. There’s a rational scientific explanation for everything Shaw and the others encounter, and the only evil involved is that of greedy people trying to cut corners and disregard the danger to the environment. 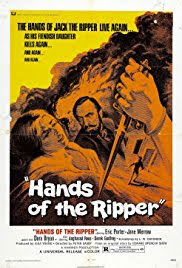 At least Quist and Ridge get more to do in this part of the film, including some scenes with George Sanders (listed, as was common in low-budget British films of this period, as a ‘guest star’). In the end, the least you can say is that big-screen Doomwatch is recognisably the same beast as small-screen Doomwatch, with all the positives and negatives that this implies. It’s a fairly intelligent film that clearly cares about the issues with which it is dealing (primarily, damage to the environment from big business) – one might expect no less from a script by Clive Exton, a very capable screen-writer. And many of the themes of the movie are reminiscent of ones touched on in the TV show – the effects of pollution on communities being the main one. On the other hand, there is a problem when what starts off looking like a certain type of horror movie ends up as something rather different – you’re braced for a particular kind of climax, which never really comes. Ultimately, this is more of a drama than anything else – and a somewhat peculiar one, if you’re unaware of the conventions of the TV show which spawned it. But the Doomwatch film stands up well as an adjunct to the TV show, even if not as a movie in its own right. A Little Drop of the Red, perhaps? By the time a film series reaches its fourth instalment your expectations generally start dropping, particularly if we’re talking about a horror franchise: the ground rules have been established in detail, all the obvious ideas have been done to death, and it’s becoming something of an exercise in going through the motions. Usually. Dracula crumbles into dust leaving only his cloak and his family seal behind. The scene shifts to late-Victorian England where the slightly annoyingly chirpy children of three respectable gentlemen (Geoffrey Keen, John Carson and Peter Sallis) are trying to do their best to enjoy themselves despite the strict rules of their parents. Alice (Linda Hayden) in particular is suffering as her father disapproves of her boyfriend Paul (Anthony Higgins), possibly because of his incredible bouffant hair. However, it soon becomes clear that the three gents are massive hypocrites, as when they’re not preaching decorum and proprietry to their wives and children they’re off secretly touring the whorehouses and other fleshpots of London. Just to keep things interesting, Dracula doesn’t go after them directly but chooses to use their own children against them, turning some of them into vampires and using hypnotism on the others. Memorable scenes result (a spade to the head, a stake through the heart and a stabbing) but it also means that for much of the film Dracula isn’t much more than a manipulator lurking in the shadows. Nevertheless, the film remains very watchable throughout, with a terrific cast full of well-known faces, lashings of atmosphere and great production values. The inimitable James Bernard provides another marvellous score, too. 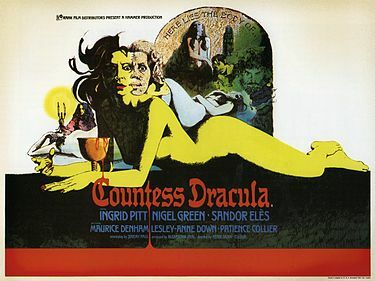 The holes in the plot remain numerous and sizeable but I for one found them very easy to forgive: the presentation of Dracula as an avenging angel of darkness is winning, and the generational-conflict angle is interesting, too (in that respect this is very much a film of its time). The climax is a little perfunctory (Dracula appears to be offed solely due to divine intervention), but having already had him blasted into ash by sunlight, drowned in running water, and impaled on a crucifix, it’s slightly understandable that they’re running out of ideas (subsequent demises would be even less satisfactory). 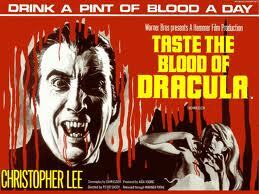 Returning to Taste the Blood of Dracula after a number of years, I was very pleasantly surprised by what a classy and solid production it is, especially compared to other Hammer movies from around this time. In terms of Christopher Lee’s involvement it may be a case of less is more, but on this evidence the blood of Dracula is definitely very more-ish.